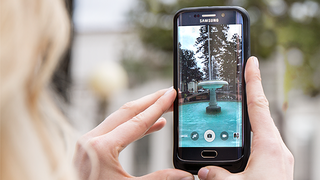 We called the Galaxy S6 the best smartphone you can buy. Some would consider that a betrayal. After all, the S6 doesn’t have removable batteries or SD card slots anymore—it’s completely sealed. But you know what? There’s a new case that might solve at least one of those problems. The $90 Incipio Offgrid not only includes a built-in 3700mAh battery that will (allegedly) double the runtime of your Galaxy S6 or Galaxy S6 Edge smartphone, it also has a microSD card reader that can add up to 128GB of additional space. Just slot in your favorite microSD card, flip a switch on the back, and Incipio claims it’ll expand the onboard storage of your device accordingly. It sounds like you can’t use the battery and the SD card at the same time, and it also looks like it’ll more than double the thickness of your phone—from a svelte 6.8mm to a pocket-perforating 15.24mm. Still, that’s no thicker than most iPhone battery cases. If you really must have your SD card and some extra battery while you’re at it, this could be a pretty good deal.